Combines a unique blend of Humane Education with STEM (science, technology, engineering, and mathematics) activities for pre-K through grade 5. All programs are aligned with Virginia’s Standards of Learning (SOL) guidelines, as well as Next Generation Science Standards. 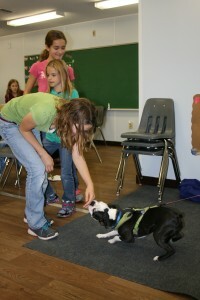 This program is delivered to you at your school by a humane educator. Cost is $6 per student. A minimum of $60 per visit is required. Includes the STEM program for Pets (available for Pre-K through fifth grade) on-site at our facility. This unique opportunity combines service learning and humane education with hands-on STEM Design challenges to encourage critical thinking and civic responsibility. This visit includes a tour of the shelter and Petting Zoo (weather permitting). $5 per student (minimum of $50 per visit).